Anne is pleased to announce that she has recently added Wills and Estate Planning as an essential service she provides to her clients, in addition to her Family Law Practice. 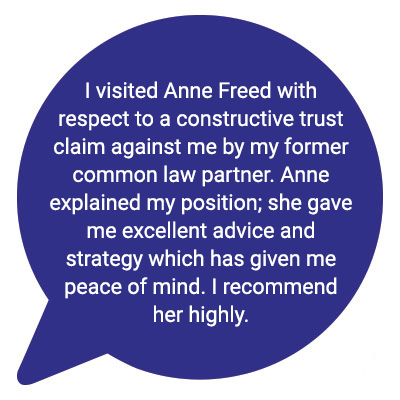 At your initial consultation, Anne reviews the facts of your case in detail, and first advises on any urgent action that must be taken. This is when we clarify your objectives and Anne explains the various process options for resolving your case. A critical component of this first meeting is to see if you can work well together. An initial consultation can also be extremely valuable as a one – time meeting if you are ambivalent, undecided or worried about what you don’t know about the legal aspects of separation. Anne provides you with the information you need to help you make your decisions going forward, decisions that can even include staying in the marriage, or making a plan to separate over time.